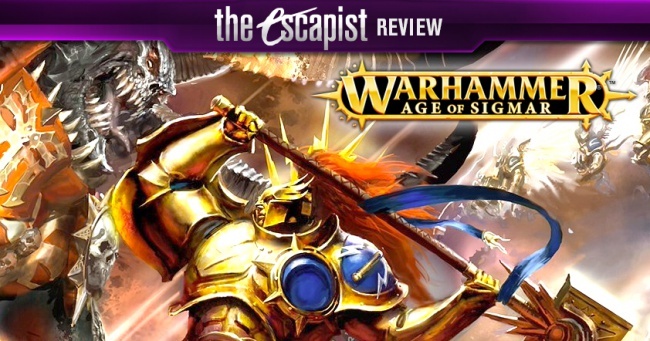 Warhammer Age of Sigmar Review - A Stepping Stone to What? Designed & Published by Games Workshop. Released July 2015. For 2 Players Ages 10+. Plays in 3-4 hours. Rules available free online. The End Times have come to a close, the mortal realms have been all but sacrificed to the forces of Chaos, and with it comes the death of Warhammer Fantasy Battles as we know it. With the death of the old comes the birth of the new. Warhammer Age of Sigmar. This is not just another edition of the game, but a brand new incarnation bringing with it brand new rules, models, factions, a new starter box, and truthfully an entirely new game all together. For some this reboot is quite exciting. Others have dreaded it since it was announced. In the weeks since the rules were released I have been spending a lot of time with the new rules and seeing how Sigmar compares to the game it replaced. I have spent a lot of time over the last 20 years playing Warhammer Fantasy Battles, so how does the new game compare to the old? Normally this is the part where I would talk about the rulebook formatting, price and structure, but I really can't do that here. There are a couple reasons for that. Firstly, is that unlike its predecessors, the rules and all associated army compendiums are available for free online. There are no stand alone army books or rulebooks to purchase, at least not in the traditional set. There is an Age of Sigmar book that contains story and fluff elements not available with the core rules. Other books may be released that may contain campaigns or formations to play with, but Games Workshop is very adamant that these are not rulebooks. This is a huge culture shock for many, as the previous editions of the rules books could be upwards of $100, and army books had started creeping up past the $30 dollar mark. Fairly expensive for things that are required to play the game beyond the already pricey models, and something that was viewed as prohibitive to new players looking to get into the game. Understandable, for sure. Here though, Games Workshop has done something that, while I have been calling for it for years, no one really thought was going to happen. The Rules for playing the game, and the army books, or "Warscrolls" as they are now called, are available free as standalone PDF downloads. The rules are four printed pages. If you're surprised by this, you aren't alone. Previous editions spanned multiple hundreds of pages for just the rulebook alone. While some of that was reserved previously for story and artwork, at least half of the pages were detailed rules and instructions on how to play the game. In Age of Sigmar, however, everything is distilled down into it's most basic pieces. 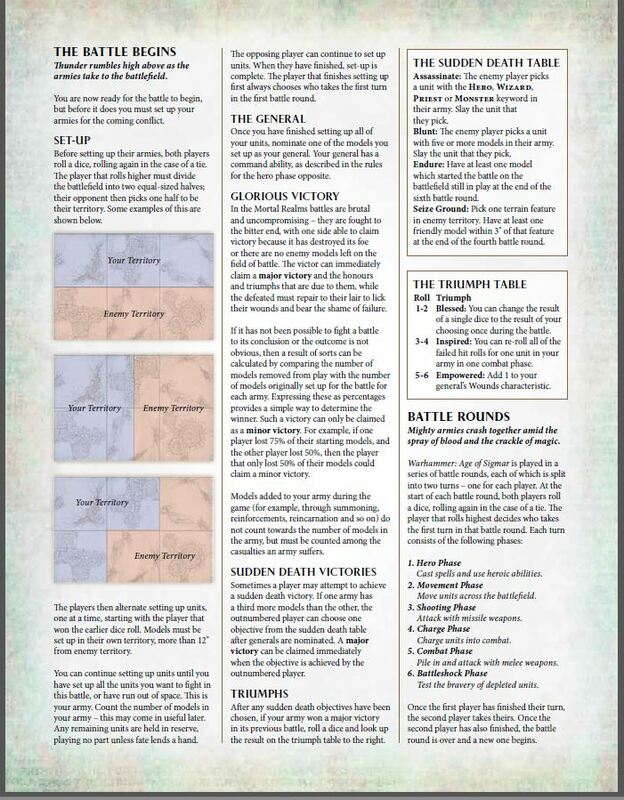 The rules explain the phases for each turn, how to move, charge and how to resolve combat, as well as the conditions for victory. It gives you a quick breakdown on how to deploy your forces and helps you set up terrain by giving you not only a table to roll on, but also breaking down what each piece of terrain does. Each terrain piece is then broken down into how it affects the gameplay and units moving around or through it, as well as recommendations on how to break up the table for placement. It's the core mechanics you would expect in a game distilled down into the most basic forms. The tools of the trade also stay the same, you need a measuring device, six-sided dice, and models to play with. There are no painting requirements, but you do at least need an army of some sort. On this side, the requirements for fielding a force are non restrictive, which means bringing whatever you want to the table. There are "factions" so to speak, but each faction is divided into one of the four main alliances. These are Chaos, Death, Destruction and Order. The interesting thing here, is that aside from these distinctions, you can field whatever you want in any combination from the allied force. This substantiates one of the biggest rumors surrounding the release of Sigmar, and furthers the idea of allowing players to play what they want. 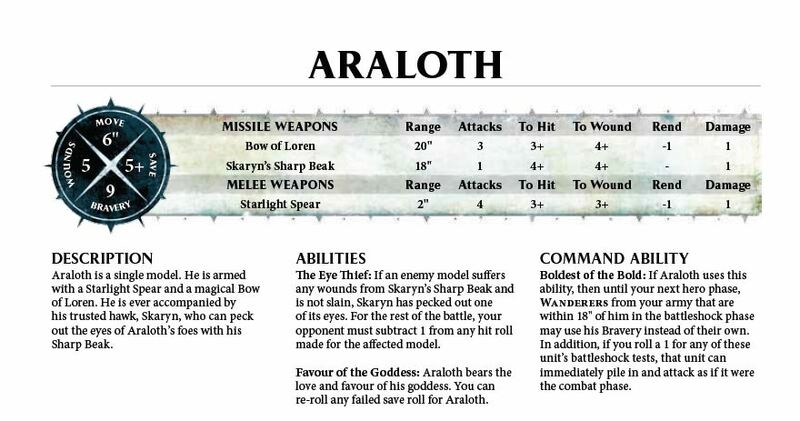 Want a unit of Wood Elf Dryads and Wardancers running in to battle alongside High Elven Sisters of Avelorn and lead by the Dark Elf lord, Maleketh the Witch King? You can do just that, since they are all allied under the forces of Order. This structure provides a lot more flexibility in forces compared to the old system, and the fact that all of the War Scrolls are free helps to facilitate that. Unit stats have also changed quite a bit, being distilled down the most necessary stats, in particular Move, Wounds, Save and Bravery. All others stats derive from the weapons given to models. There are no more charts comparing values to determine what you need to roll for success or failure. Now, you have flat values to make. For example, Wood Elf Waywatchers have Asari Longbows. They will always hit on a 3+ roll and wound on a 4+. Weapons also have a Rend and a Damage value. Rend values tell you how to affect the Save of the target you're hitting, and the damage will tell you how many wounds of damage you deal. The number of attacks is also determined by the weapon your model is using as opposed to a core unit stat. On top of the new factions and stats, one of the first things you may notice is that none of the units have a point value like in most other Wargames, and only have model count ranges and not strict unit sizes. We'll get into that later, but in short it falls to the players to decide what a fair matchup is. Overall the game is rules light and focuses more on having fun than worrying about charts, complicated rules, and spending time flipping through books to figure out how to resolve combat or progress the game. It's not a bad thing, though it does lead to some Ridiculous Rules for older models that have a bearing on the game. We could spend a lot of time going through each of the turn sequences, and combat in depth, but the rules are straight-forward and easy to understand.